A hero building adventure board game system. 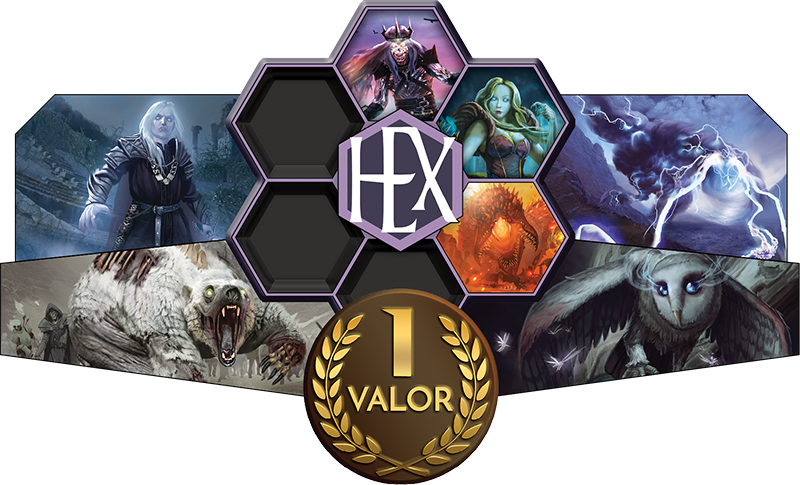 HEXplore It features an optional point system called Valor. Players may gain points of Valor by completing difficult tasks in each HEXplore It game. These points follow the players, not the heroes, so you'll accumulate more points the more you play. A point of Valor is awarded when specific milestones are achieved while playing any HEXplore It game. A player’s Valor score is equal to the total Valor gained while playing any game in the series. All players playing a game of HEXplore It have a Valor score equal to the player with the highest Valor score at the table. Valor may only be gained once per source, and cannot be modified by other game effects. There are many ways you may gain a point of Valor. Consult the lists below for more information. If you have cookies enabled, you'll be able to save your selections for future use. You can even use this handy survey to record your Valor.